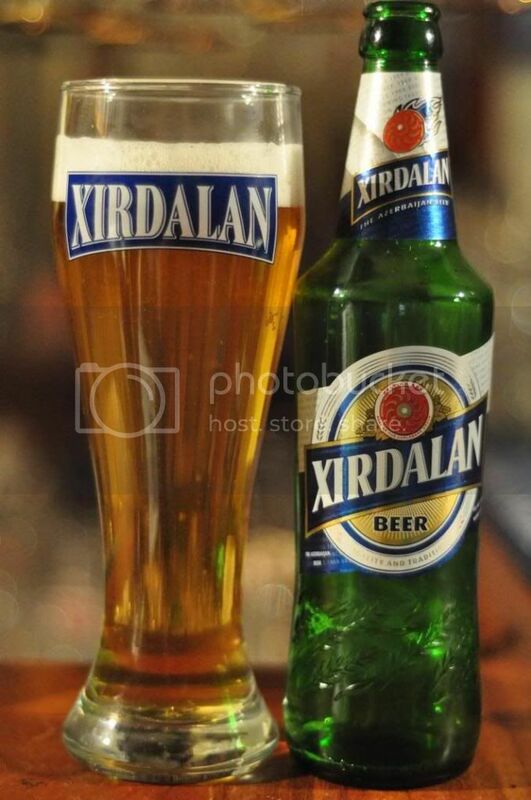 Xirdalan is not only one of very few Azeri beers I know of, but one of very few beers with a name starting with "X". It's always good to tick off another country in this European Beer Challenge so I can't wait to try this beer! A big thank you is owed to the people at Baltika-Baku who helped get this to Australia. Azerbaijan is not a country that is synonymous with beer producing or drinking worldwide. After I did some googling I found out that there is actually quite a good sized drinking culture in Azerbaijan and that the majority of the beer drunk are light coloured lagers. Xirdalan is the most consumed beer in Azerbaijan and so is the perfect beer to represent the borderline European country in this challenge. This pours like you would expect a lager to, it has a clear golden body with plenty of carbonation rising to a 2 finger white head. The head seems to have a large number of very small bubbles which fade quickly until there is only a thin film of head on the surface of the beer. What little head there is laces the glass beautifully though. If there was a little more head this would be a really sensational looking lager, as it is it's a good looking beer. Xirdalan has quite a strong nose for a lager. It's mostly grainy but there are some nice grassy hops towards the backend which smell quite bitter. Theres an odd smell, somewhat like cooked broccoli, which I don't think I've ever smelt in a beer before. Unlike most lagers this beer actually smells really appealling, albeit odd, hopefully it tastes as good as it smells. By far the most important element of any beer is the flavour and Xirdalan is a fantastic example of this. It's a strong flavoured lager with lots of bready malts dominating the beer more so than any other lager we have in Australia. This maltiness continues even when the grassy hops kick in at the backend of the palate. The carbonation levels are lively without being over bearing. It's a really enjoyable lager! The national beer of Azerbaijan has all the qualities I look for in a lager in abundance. It's flavoursome, it's refreshing and it's incredibly drinkable. Xirdalan is quite a different take on a lager than many people in Australia would be used to, but it was the perfect beer for the hot day I drank this on. If the price is right importers should definitely be looking at this beer in the future, it'd sell well here during our hot summer.